Was named a recipient of the Thurman Munson Award in February 2019. Was tabbed by Sporting News as the AL "Rookie of the Year" as voted on by his peers after hitting .297 (170-for573) with 83R, 47 doubles, 27HR and 92RBI in 149 games (132GS at 3B, 13 at DH) with the Yankees, the highest single-season batting average by a Yankee since Robinson Canó hit .314 in 2013…led all Major League rookies in hits, doubles, RBI, extra-base hits (76) and multi-hit games (53), tied for first in HR and ranked second in runs and batting average…was the 15th Yankes rookie with at least 150H in a season...Ranked second in AL "Rookie of the Year" voting to the Angels' Shohei Ohtani, collecting five first-place votes, 20 second-place votes and four third-place votes…was named to Baseball Digest's 2018 Rookie All-Star team...Set the Yankees' single-season rookie record with 47 doubles (previous: Joe DiMaggio, 44 in 1936)…were tied with Boston's Fred Lynn (1975) for the most ever by an AL rookie and the second-most by any rookie in Major League history behind only Brooklyn's Johnny Frederick in 1929 (52)...Had 76XBH, third-most in a season by a rookie in Yankees history behind Joe DiMaggio (88 in 1936) and Aaron Judge (79 in 2017)...Became the first rookie third baseman (min. 50% of games at 3B) in Major League history with at least 40 doubles and 25HR in his rookie season…is the seventh rookie, age 23-or-younger, to reach the marks, joining Hal Trosky in 1934, Joe DiMaggio in 1936, Ted Williams in 1939, Nomar Garciaparra in 1997, Albert Pujols in 2001 and Corey Seager in 2016...Joins Joe DiMaggio (1936) as the only rookies in Yankees history to hit at least 40 doubles and 20HR in a season…joins the Dodgers' Corey Seager (2016) as the only rookies to accomplish the feat since 2007...Is one of four Yankees rookies to hit at least 25HR in a season, joining Aaron Judge (52HR in 2017), Joe DiMaggio (29HR in 1936) and Joe Gordon (25HR in 1938)…is one of four Yankees rookies with at least 20HR since 2016 (also Gary Sánchez-20HR in 2016, Aaron Judge-52HR in 2017 and Gleyber Torres-24HR in 2018)...With teammate Gleyber Torres hitting 24HR, became the first pair of Yankees rookies to hit 20HR in the same season…according to Elias, were the eighth set of rookie teammates to both hit 20HR, the first since Cincinnati's Joey Votto and Jay Bruce in 2008…the Yankees are the sixth team in Major League history with multiple rookies with at least 20HR and 60RBI, joining the 2006 Marlins (Mike Jacobs, Dan Uggla, Josh Willingham), 1982 Twins (Gary Gaetti, Kent Hrbek), 1977 Athletics (Wayne Gross, Mitchell Page), 1975 Red Sox (Fred Lynn, Jim Rice) and 1960 Orioles (Jim Gentile, Ron Hansen)...Was the fifth Yankees rookie with multiple grand slams in the same season (6/5 at Toronto and 9/15 vs. Toronto), joining Shane Spencer (three in 1998), Russ Derry (two in 1945), Yogi Berra (two in 1947) and Hideki Matsui (two in 2003)...Was the second Yankee since 1952 to hit .290-or-better with at least 50XBH in a rookie season, joining Robinson Canó in 2005 (.297, 52XBH)…was the eighth Yankees rookie with 90RBI in a season, the third since 1963 (Judge-114 in 2017, Matsui-106 in 2003)...Is one of seven Yankees since 1913 to collect at least 50 multi-hit games in his rookie season, joining Joe DiMaggio (66 in 1936), Earle Combs (65 in 1925), Tom Tresh (54 in 1962), Ben Chapman (52 in 1930), Derek Jeter (50 in 1996) and Phil Rizzuto (50 in 1941)…marked the third-most by an AL rookie over the last 15 seasons (since 2004) behind Mike Trout (56 in 2012) and Delmon Young (55 in 2007)...Of his 27HR, 12 tied the game (four) or gave the Yankees the lead (eight)…nine of his HRs came in the seventh inning or later…hit 14 of his 27HR when behind in the count, four more than any other Major League player this season...Was the first Yankee, age-23 or younger, to hit 25HR in a season since Bobby Murcer (26HR) at age-23 in 1969...Had 12HR during the first half, one of five Yankees rookies to hit at least 10HR before the All-Star break, joining Aaron Judge (30HR in 2017), Gleyber Torres (15HR in 2018), Joe DiMaggio (11HR in 1936) and Nick Johnson (11HR in 2002)-credit: Elias…joined Torres as the first Yankees rookies with at least 10HR before the All-Star break in the same season (first team to do so since the 2016 Dodgers: Corey Seager-17, Trayce Thompson-13)...Hit 27 doubles in the "first half," the most by a Yankee before the All-Star break since Hideki Matsui collected 30 in 2003...Was recalled from Triple-A Scranton/Wilkes-Barre on 4/1 without appearing in a game with the RailRiders…remained at the Major League level for the rest of the season...Had at least one extra-base hit in seven straight games from 4/13-23 (8 doubles, 1 triple, 3HR), collecting multiple XBH in five of those games…was the second-youngest Yankee in franchise history with at least 1XBH in seven straight games (DiMaggio, 7G, 6/4-11/37, ending at age 22y, 198d according to Elias)…is one of six players his age (23y, 52d) or younger to have as long a streak over the last 20 seasons (since 1999), joining Ronald Acuña, 8G in 2018; Cody Bellinger, 7G in 2017; Corey Seager, 7G in 2016; Freddy Freeman, 8G in 2012 and Albert Pujols, 7G in 2001...Tied a Yankees franchise record with three straight games with multiple extra-base hits (28th time) from 4/13- 17…was the second Yankees 3B with at least 2XBH in three consecutive games, joining Bob Meusel (7/9-11/1920)...Hit solo HR-the first of his Major League career-in the ninth in 4/17 loss vs. Miami...Was 4-for-4 with 1R, 2 doubles and 1RBI in 4/22 win vs. Toronto…at 23 years, 51 days old, was the youngest Yankee to have at least 4H in a game since Melky Cabrera (21y, 292d) on 5/30/06 at Detroit…was the youngest Yankee to go 4-for-4 or better since Derek Jeter on 7/2/96 vs. Boston (4-for-4 at 22 years, 6 days)…was the youngest Yankee to go 4-for-4 or better with at least 2XBH since Thurman Munson, who went 4-for-4 with 1 double and 1HR on 7/28/70 at California, at exactly the same age as Andújar (23.051)...Hit "walk-off" RBI single-his first career "walk-off" hit-in the ninth and was 2-for-5 with 2R in 5/4 win vs. Cleveland…at 23 years, 63 days old, was the second-youngest Yankee with a "walk-off" hit since 2010 (Clint Frazier, 22y, 305d on 7/8/17 vs. Milwaukee)…Gleyber Torres (21y, 144d) hit a "walk-off" HR two days later...Was named AL "Rookie of the Month" for June, his first career monthly award…in 25G, hit .264 (24-for-91) with 10R, 6 doubles, 7HR and 20RBI, leading all Major League rookies in home runs and extra-base hits (13) and tying for first in RBI (first in the AL)…was the sixth Yankee (ninth time) to win AL "Rookie of the Month" and the fourth current Yankee to do so, joining Gary Sánchez (Aug. 2016), Aaron Judge (four times in 2017) and Gleyber Torres (May 2018)...Hit first career grand slam in 6/5 win at Toronto…at age 23y, 95d, became the youngest Yankee to hit a grand slam since Melky Cabrera (age 21y, 328d) on 7/5/06 at Cleveland…according to the YES Network, was the third Yankees rookie third baseman to hit a grand slam, joining Horace Clarke 9/21/65 and Mike Pagliarulo 9/18/1984...Hit safely in 21-of-24 games in July, batting .330/.379/.443 (29-for-88) with 13R, 7 doubles, 1HR, 8RBI, 6BB and 1HP...Batted .318/.352/.557 (89-for-280) with 46R, 22 doubles, 15HR and 53RBI in 73 games from 7/9-9/30...Recorded his 100th career hit in his 92nd career game (7/23 at Tampa Bay)…among players to debut since 1942, is tied with Gary Sánchez for the third-fastest Yankees to reach 100 career hits, behind Hideki Matsui (81G) and Robinson Canó (87G)...Was named AL "Rookie of the Month" for August after batting .320 (39-for-122) with 21R, 7 doubles, 10HR, 29RBI, 4BB and 1SB in 30 games…tied for the AL lead in HRs (with Oakland's Khris Davis), tied for the MLB lead in RBI (with Texas' Rougned Odor) and tied for second in the Majors in hits…marked the fifth time in Yankees history a rookie hit at least 10HR in a calendar month, following Aaron Judge (15HR in Sept. 2017, 10HR in April 2017, 10HR in June 2017) and Gary Sánchez (11HR in August 2016)…was the third rookie in Yankees history to hit .320-or-better with at least 10HR in a month (Judge, June 2017 and Sánchez, August 2016)…was tied for the third-highest RBI total by a Yankees rookie in a month, joining Bob Meusel (42RBI in July 1920), Judge (32RBI in Sept. 2017), Hideki Matsui (29RBI in June 2003), Bill Johnson (29RBI in July 1943) and Joe DiMaggio (29RBI in June 1936)…were the fourth-most RBI by any Yankee in a calendar month since the start of 2012 behind Aaron Judge (32 in Sept. 2017), Alfonso Soriano (31 in August 2013) and Didi Gregorius (30 in April 2018)...Hit game-tying solo HR in the seventh and hit game-winning single in the 13th on 8/7 at Chicago-AL, going 3-for-5 with 1HP…was the first Yankees rookie with multiple go-ahead/game-tying hits in the seventh inning or later since Bernie Williams on 10/5/91 vs. Cleveland (go-ahead single in seventh, game-tying single in ninth)…was tied for the latest go-ahead hit by a Yankees rookie since Mike Blowers hit a two-run single in the 15th inning on 6/22/90 at Toronto (Brett Gardner also hit a "walk-off" single in the 13th inning on 8/16/08 vs. Kansas City)...Reached base safely in a career-high 17 straight games from 8/17-9/3, batting .333 (23-for-69) with 14R, 4 doubles, 4HR, 17RBI and 5BB over the span...Collected multiple hits in all four games of the Yankees' series at Baltimore from 8/24-26, going 9-for-19 (.474) with 3R, 1 double, 1HR and 6RBI…were tied for the most hits by a Yankee in a single series since the start of 2014 (also Carlos Beltrán, 9-for-18 from 5/19-22/16 at Oakland; and Didi Gregorius, 9-for-15 from 7/27-30/15 at Texas)...Hit his 44th double of the season in the fourth inning of 9/28 win at Boston, tying Joe DiMaggio (44 in 1936) for most in a single season by a Yankees rookie…surpassed DiMaggio in the fifth inning of 9/29 win at Boston...Made his postseason debut, starting four of the Yankees' five playoff games at 3B and going 2-for-10 with 2BB...In 15 spring training games with the Yankees, hit .267 (12-for-45) with 8R, 2 doubles, 1 triple, 4HR, 10RBI, 3BB with a .928 OPS…was named the recipient of the 2018 James P. Dawson Award, given annually to the outstanding Yankees rookie in spring training. Saw his ﬁrst Major League action, appearing in ﬁve games (1 start at DH) over three stints with the Yankees (6/28-29, 6/30-7/1 and 9/16-10/1) and hitting .571 (4-for-7) with 2 doubles and 4RBI... Made his Major League debut in 6/28 win at Chicago-AL, starting at DH and going 3-for-4 with 1 double, 4RBI, 1BB and 1SB…collected his ﬁrst Major League hit with a bases-loaded single oﬀ Carlos Rodón in the ﬁrst inning... set a Yankees record in RBI in a Major League debut (previously 3RBI, Marv Throneberry on 9/25/55-G1 and Billy Martin on 4/18/50)…according to ESPN Stats & Info, joined Rogers Maris (4/19/60 at Boston) and Raúl Ibañez (4/6/12 at Tampa Bay) as the only players with 4RBI in their Yankees debuts…became the 12th player in Major League history (ninth in the AL) to record at least 3H and 4RBI in his Major League debut…since 1949, was only the second Yankee with 3H in his Major League debut (also Mike Pagliarulo, 3-for-5 on 7/7/84 at Minnesota)... became the sixth Yankee to make his Major League debut as the starting DH and, at 22 years, 118 days old, the second-youngest (Jesus Montero - 21y, 277d on 9/1/11 at Boston)... With Tyler Wade's debut on 6/27, his on 6/28 and Dustin Fowler debuting on 6/29, the Yankees had position players make their Major League debuts on three straight days for the ﬁrst time since Jack Little, John Dowd and Bill Otis from 7/2-4/1912 (credit: Elias)... Led all Yankees minor leaguers in season batting average (.315) and doubles (36), ranked third in RBI (82) and tied for fourth and set a career high in HR (16)…struck out in just 13.6% of his 522PA (71K)... Began the season with Double-A Trenton, hitting .312 (79-for-253) with 30R, 23 doubles, 7HR and 52RBI in 67G... Was promoted to Scranton/WB on 6/19 and hit .317 (72-for-227) with 36R, 13 doubles, 9HR and 30RBI in 58 games…in eight postseason games for the RailRiders, hit .235 (8-for-34) with 1R, 4 doubles, 1HR and 5RBI... Following the season, played for the Cibao Giants in the Dominican Winter League, batting .185 (12-for-65) with 7R, 1HR and 4RBI in 18 games... Following the season, was tabbed by Baseball America as the Yankees' No. 5 prospect and the No. 59 prospect in baseball…was also named an MiLB.com Organization All-Star. Split the season between Single-A Tampa and Double-A Trenton, batting a combined .273/.332/.410 (140-for-512) with 62R, 26 doubles, 4 triples, 12HR, 83RBI and 39BB in 130 games…ranked second among Yankees minor leaguers in RBI…hit .290 (113-for-390) vs. right-handed pitching…was named an Organization All-Star by MiLB.com. Started the season in Tampa and hit .283 (65-for-230) with 34R, 10 doubles, 2 triples, 10HR and 41RBI in 58 games to earn a spot on the FSL Mid-Season All-Star Team…notched his second career multi-HR game on 5/28 at Brevard County (3-for-5, 2R, 2HR, 5RBI)…was promoted to Trenton on 6/14. In 72 games with Trenton, hit .266 (75-for-282) with 28R, 16 doubles, 2 triples, 2HR and 42RBI…hit .423 (22-for-52) with 11RBI over his first 13 games with the Thunder. Following the season, played for Scottsdale in the Arizona Fall League and hit .284/.364/.373 (19-for-67) with 10R, 2 doubles, 2 triples, 5RBI and 9BB in 19 games…was named to the league's Fall Stars Game. Was added to the Yankees' 40-man roster on 11/18/16. Batted .243 (118-for-485) with 54R, 24 doubles, 5 triples, 8HR and 57RBI in 130 games for Single-A Tampa…stole 12 bases in 13 chances (92.3%)…was named a Florida State League Mid-Season All-Star... His 15-game hitting streak from 8/9-25 (.328, 19-for-58) was the fourth-longest in the FSL... Following the season, was tabbed by Baseball America as the No. 10 third baseman in the minors. Spent the entire season with Single-A Charleston, batting .267 (129-for-484) with 75R, 25 doubles, 4 triples, 10HR, 70RBI and 35BB in 127 games…ranked third in the Yankees organization in RBI... Following the season was tabbed by Baseball America as the No. 10 prospect in the Yankees organization. Spent the season with the GCL Yankees 2, batting .323/.368/.496 (43-for-133) with 18R, 11 doubles, 4HR and 25 RBI in 34 games. Made his professional debut with the GCL Yankees, hitting .232 (41-for-177) with 21 R, 9 doubles, 1 HR and 19 RBI in 50 games. April 1, 2019 New York Yankees placed 3B Miguel Andujar on the 10-day injured list. Right shoulder strain. April 1, 2018 New York Yankees recalled 3B Miguel Andujar from Scranton/Wilkes-Barre RailRiders. March 18, 2018 New York Yankees optioned 3B Miguel Andujar to Scranton/Wilkes-Barre RailRiders. October 24, 2017 3B Miguel Andujar assigned to Gigantes del Cibao. October 22, 2017 Miguel Andujar roster status changed by New York Yankees. October 3, 2017 New York Yankees reassigned 3B Miguel Andujar to the minor leagues. September 16, 2017 New York Yankees recalled 3B Miguel Andujar from Scranton/Wilkes-Barre RailRiders. July 24, 2017 Scranton/Wilkes-Barre RailRiders activated 3B Miguel Andujar from the temporarily inactive list. July 22, 2017 Scranton/Wilkes-Barre RailRiders placed 3B Miguel Andujar on the temporarily inactive list. July 1, 2017 New York Yankees optioned 3B Miguel Andujar to Scranton/Wilkes-Barre RailRiders. June 30, 2017 New York Yankees recalled Miguel Andujar from Scranton/Wilkes-Barre RailRiders. June 29, 2017 New York Yankees optioned 3B Miguel Andujar to Scranton/Wilkes-Barre RailRiders. June 28, 2017 New York Yankees recalled Miguel Andujar from Scranton/Wilkes-Barre RailRiders. June 19, 2017 3B Miguel Andujar assigned to Scranton/Wilkes-Barre RailRiders from Trenton Thunder. March 15, 2017 New York Yankees optioned 3B Miguel Andujar to Trenton Thunder. November 18, 2016 New York Yankees selected the contract of Miguel Andujar from Trenton Thunder. June 14, 2016 3B Miguel Andujar assigned to Trenton Thunder from Tampa Yankees. March 10, 2016 3B Miguel Andujar assigned to New York Yankees. April 9, 2015 3B Miguel Andujar assigned to Tampa Yankees from Charleston RiverDogs. March 31, 2014 3B Miguel Andujar assigned to Charleston RiverDogs from GCL Yankees2. July 17, 2013 3B Miguel Andujar assigned to GCL Yankees2 from GCL Yankees1. 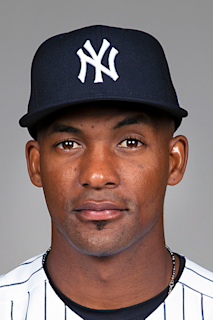 June 21, 2013 Miguel Andujar roster status changed by GCL Yankees1. June 18, 2012 3B Miguel Andujar assigned to GCL Yankees. July 20, 2011 New York Yankees signed free agent 3B Miguel Andujar to a minor league contract.